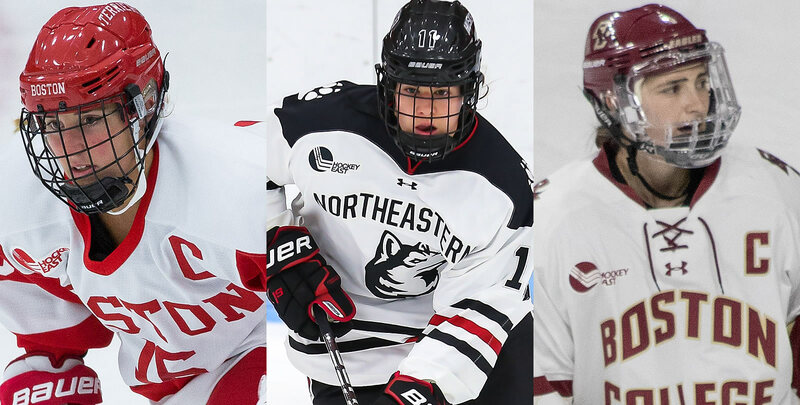 Northeastern secured at least a share of the 2018-19 Hockey East regular season crown with a win on Friday against Merrimack. The Huskies need just one more point in league play in order to secure their first regular season crown since 2011-12. 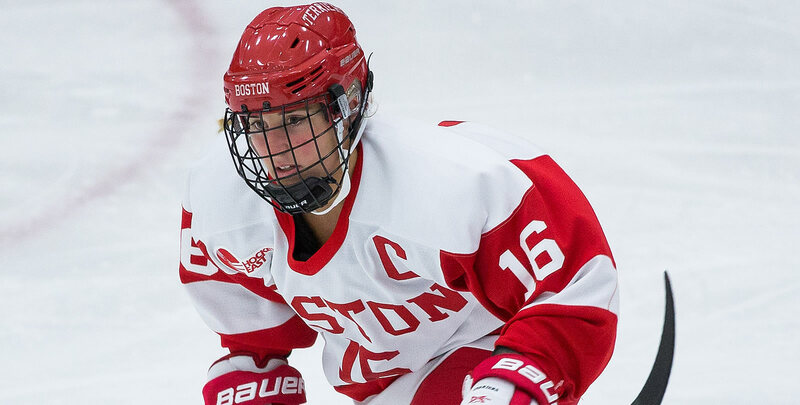 Boston University advanced to the Women's Beanpot championship, winning a shootout, 2-1, over #3 Northeastern after the teams skated to an official 3-3 tie. After a 7-1 win over Holy Cross on Saturday, the Terriers now own the longest unbeaten streak in the nation, going 8-0-2 since Jan. 6. Megan Keller (Farmington Hills, Mich.) had a four-point outing in a 7-1 win over New Hampshire on Friday, netting two goals, including the game-winner, and picking up two assists. Her goal in the first period set a new Hockey East single-season goal record for a defenseman (13). Keller now owns league records for a defender in career goals, assists, points and single-season goals, assists, points. Providence traveled to Maine and took a 1-0-1 mark in league play, retaining its hold on the fourth spot in the Army ROTC Hockey East Standi ngs. Madison Myers (Colchester, Vt.) stopped a total of 48 shots on the weekend for the Friars, allowing just three goals to finished with a 1.50 goals against average and a .926 save percentage. The 41st annual Women's Beanpot, college hockey's longest running women's tournament, culminates Tuesday night at Harvard University. The host Crimson and Boston University will battle for Boston bragging rights, as the championship game will be televised on NESNplus immediately following the consolation game between Northeastern and Boston College. Tickets to the 2019 Women's Hockey East Championship hosted by Providence College are now on sale. Fans can purchase adult tickets online at Friars.com/tickets for the semifinals on Saturday, March 9, and for the championship on Sunday, March 10 or by calling 401-865-4672. Sammy Davis (Pembroke, Mass.) in two games, racked up five points (3g, 2a) and netted two third-period goals in a 7-1 win over Holy Cross on Saturday. Last Tuesday, she notched a goal and set up the game-tying goal in the third period of a 3-3 tie against #3 NU in the Beanpot semifinals. No league player had more goals, points, or a better plus/ minus rating (+3) than Davis, who reached the 20-goal mark for the first time on Saturday. 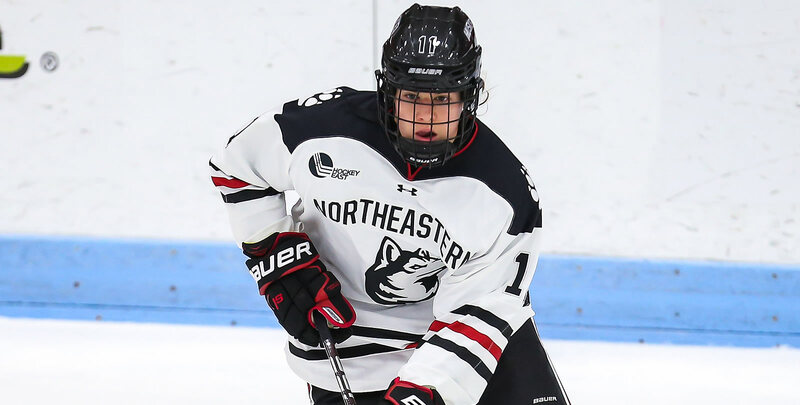 Alina Mueller (Winterthur, Switzerland) tied for the WHEA lead in scoring last week, posting two goals and three assists for five points as Northeastern picked up a 1-0-1 record. 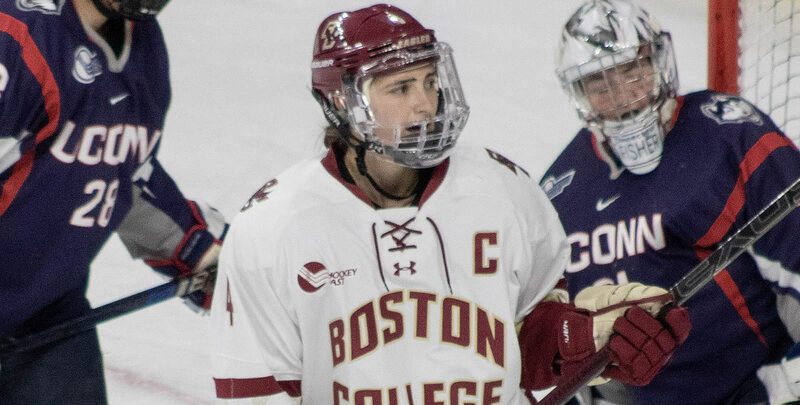 She scored a goal and added an assist in Tuesday's 3-3 tie in the Beanpot semifinals and found the back of the net again in the shootout. She then picked up a goal and two assists in Friday's 6-3 win over Merrimack that secured a share of the WHEA regular season tile and the number one seed in the WHEA Tournament. Megan Keller (Farmington Hills, Mich.) had a fourpoint outing against New Hampshire on Friday, netting two goals, including the game-winner, and picking up two assists. Her goal in the first period set a new Hockey East single-season goal record for a defenseman (13). Keller now owns league records for a defender in career goals, assists, points and single-season goals, assists, points. She also blocked nine shots. Kelly Pickreign, BC (Fr., G; Harvard, Mass.) Earned her first career win with an 18-save outing against UNH on Friday. Boston College is now the only Hockey East school with at least three goaltenders with at least one win. Corinne Schroeder, BU (Elm Creek, Man.) in Tuesday's win over #3 Northeastern in the Beanpot semifinals, she stopped 31 shots to backbone the Terriers to a 3-3 tie and made two more stops in a shootout to secure the Terriers spot in the championship game. She stopped 16 of 17 shots in Saturday's win over Holy Cross. Courtney Correia, BU (Fr., F; Whitby, Ont.) Tallied a career-best two goals in a 7-1 win over Holy Cross on Saturday. Tristyn Svetek, UConn (Jr., D; Burlington, Ont.) Helped the Huskies to a 1-0-1 mark in a weekend series with Vermont, finishing with two points (1g, 1a) and seven blocked shots. She scored the game-winning goal in Friday's 3-2 victory. Keisha DiCaire, MC (Fr., F; Ottawa, Ont.) Posted her first multi-point game of the season, earning the game-winning assist and adding the go-ahead goal in Merrimack's first-ever win at the Whittemore Center. The Warriors took sole possession of fifth place in Army ROTC Women's Hockey East standings. Skylar Fontaine, NU (So., D; East Greenwich, R.I.) Pushed her point streak to seven games (4g, 6a) with a goal on Tuesday and two assists on Friday. Meaghan Rickard, PC (Jr., F; Coventry, R.I.) Netted two goals over a 1-0-1 weekend at Maine, tallying once in each outing. She now is has a point in three of her last four games. Madison Myers, PC (Sr., G; Colchester, Vt.) Stopped a total of 48 shots on the weekend in a 1-0-1 mark at Maine. She allowed three goals and finished with a 1.50 goals against average and a .926 save percentage.